It May Be Knocking On A Bit, But Another Of My Car Boot Bargains Could Be A Winner! Ho Ho! Christmas came early for me this morning while wandering around my local car-boot sale, when what should I come across but a Sharp HC-4600 Pocket or Handheld PC! I have to admit I was excited when I saw it, I'm a big fan of small, mobile PC's, but I wasn't very hopeful that I'd be able to get it. It was quite late in the day, so the fact that this PC was still there must mean that either it was too expensive or didn't work. The Sharp Pocket PC is a clam-shell design, with a colour screen, and this one came in a nice leather case, instructions, stylus, but alas no charger. Also it wouldn't turn on. Bad sign to say the least. The seller assured me that it was working earlier, but that it had just gone flat with people trying it out. "How much do you want for it?" I asked. The money was out of my wallet in a flash, he and his wife looked like a genuine couple, so it was well worth the risk. 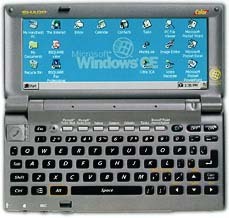 I'd always fancied this type of Pocket PC, similar to a HP Jornada, but they're a bit too expensive. I skipped around the rest of the car boot sale, pestering my Wife to go home early, but she was having none of it, so I had to wait another hour and a half before I could see if my new toy worked! Getting home I scoured the house, shed, loft and garage for a compatible 5v charger. After almost giving up I saw my son's PSP adaptor, it was the right voltage, and surprise it had the right connector! Plugging it in, the HC-4600 sprang into life, its lovely colour screen so much brighter than my Psion's. The keyboard isn't that great, I'd say somewhere between the quality of a Revo and a series 5. This Pocket PC is very old. It's running Window's CE ver 2.0, which came out in about 1997. This worried me a little, not because of the usability of the software, but more to do with the age on the rechargeable battery. The Sharp uses Ni-Cd's, which are notorious for their "memory effect" and eventually taking no charge at all. We will have to see. A quick look around the applications available revealed Pocket versions of Word, Excel, PowerPoint, Internet Explorer and Outlook, more than good enough for my needs. Having used the newer versions of these with my XDA I'm sure they'll be OK. I used the Pocket Word application and it's a little basic and the US spell checker can be annoying, but it's as good as WordPad on new PC's, so that'll do for me. I think I'll be using the Sharp PC as a mobile device for writing articles for my websites, as long as I can get it connected to my desk-top, which will necessitate a new serial lead. When you're used to using grey-scale Psion's', the jump to a color screen is amazing, it feels like you're working on a "proper pc" (sorry Psion! ), and low light situations is no problem. Obviously the trade off is a much shorter battery life - my Psion Revo can go over a week between charges, whereas this Sharp will only last a few hours. First impressions are very good - I just love the colour screen - I'll report back in a few weeks with more comments after I've been using it in anger for long enough. I want to ask you something. I didn't ever seen a pocket pc like this. I just now have my own . Could I install an other version or windows in it ? If Yes , how ? With it's ports I/O ? What is it's memory ? My touch pad doesn't work well . Can use this to connect with another port ( USB for example) ? I don't think you can install other versions of Windows. I purchased a Sharp HC4600 many years ago and used it for several years then it ended in the back of a draw. I found it this weekend and out of curiosity I found a changer, replaced the backup battery and wonders, it worked. The screen is better than the palm E2 but then I found out why I had discarded it in the first place. The touch screen isn't, no sign of life whatever I have tried. Tried the Sharp web pages but they deny all knowledge of HC4600. I then found your artical on buying one for £12 and wondered if you had any other info that might be available. Jim. If you really like it, get another on eBay, but the problem is that the batteries will have a really short life, if they work at all. If you like the form factor, get a Psion 5 instead.